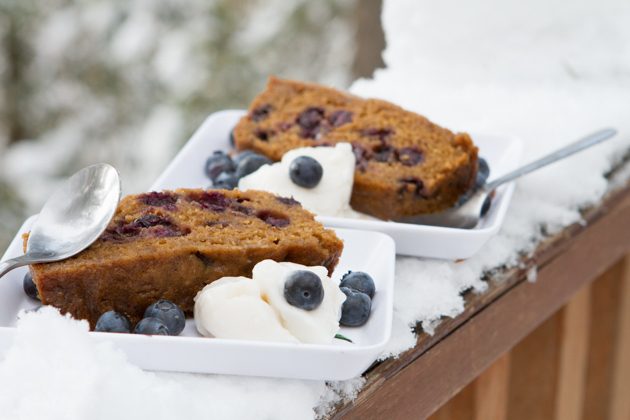 Nutrient-rich, nourishing gluten-free blueberry cake drizzled with maple syrup… baked for 4 hours in your slow cooker. I bought this Crock Pot as a New Year’s gift… for myself. The 10 hours I spend in the kitchen, daily, testing + creating new recipes for the blog, leaves me with 0 creativity for family meals and treats. We often have the same style of meal, every night:: roasted vegetables, salad, animal protein, with fruit and nuts for dessert. 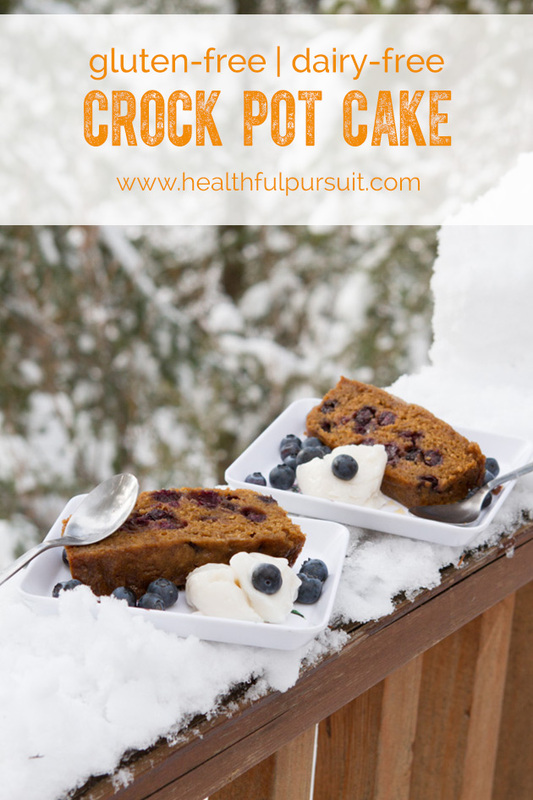 Buying this (inexpensive and so totally awesome) Crock Pot was a last-ditch effort of breaking free from our dinner routine. And, of course, when I say dinner routine, I mean dessert routine. Dinners will come later. I wanted to see if I could bake a cake with this new gadget of mine. And girl, I made a CAKE! I doubted this recipe from the very beginning. 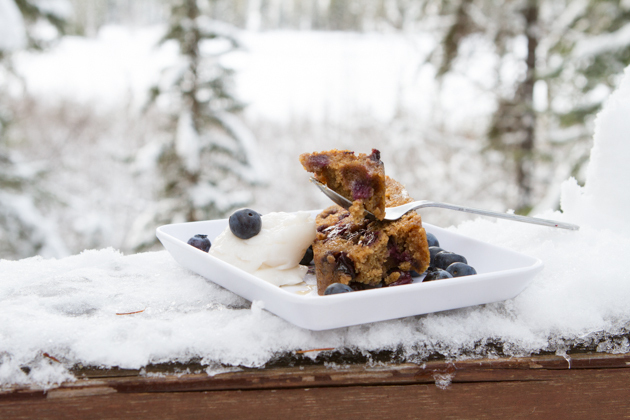 Moist, fell right out of the pan, nourishing, dense (in all the right ways), delicious. 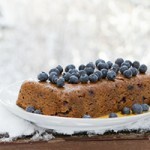 Nutrient-rich, nourishing gluten-free blueberry cake drizzled with maple syrup... baked for 4 hours in your slow cooker. Line the bottom of a 8 x 4 loaf pan with parchment paper and use a dab of coconut oil to oil the sides. Set aside. Pour 3 cups of water in a kettle or pot and heat on high until boiling. Meanwhile, add dry ingredients to a large bowl. Set aside. In a separate large bowl, add coconut sugar and coconut oil. Beat with a stand mixer or hand mixer until creamed, about 2 minutes. Add dairy-free yogurt, eggs and vanilla. Beat again until creamy, about 1 minute. Drop half of the dry mixture into the bowl with the egg mix. Mix with a spoon until incorporated. Add remaining dry mixture and mix again with the spoon. Fold in half of the blueberries. 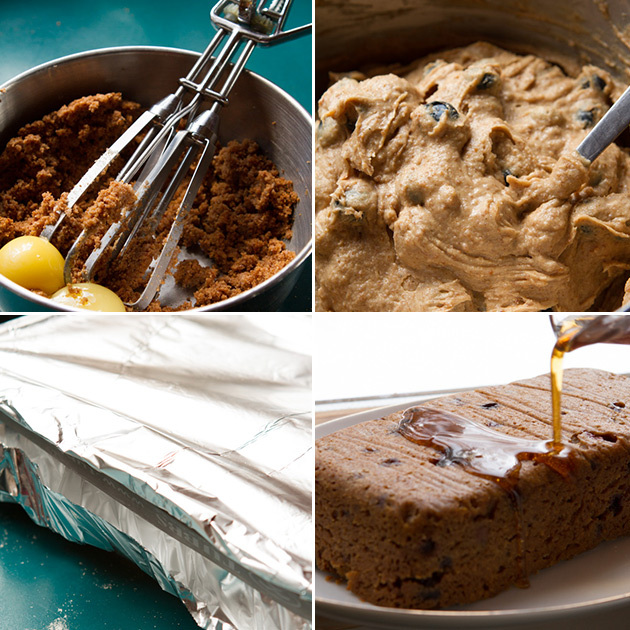 Drop mixture into prepared loaf pan and cover with foil, wrap tightly with string or a thick elastic band. Cover the bottom of the Crock Pot with the boiling water. I used about 1-1/2 to 2 cups of the boiling water. Lay loaf pan in boiling water so that it goes 1-inch up the sides. You can test this by inserting a knife on the side of the loaf pan to see where the water is sitting. You may have to add or remove water, depending on the size of your Crock Pot. Bake on high for 4 hours. Remove from the slow cooker, take off the elastic or string and tin foil. Run a knife along the sides, just to loosen them. Allow to cool for 5 minutes in the pan. Carefully flip the pan over onto a serving plate, be gentle! The cake should just slide out. Once out, remove the parchment paper top. 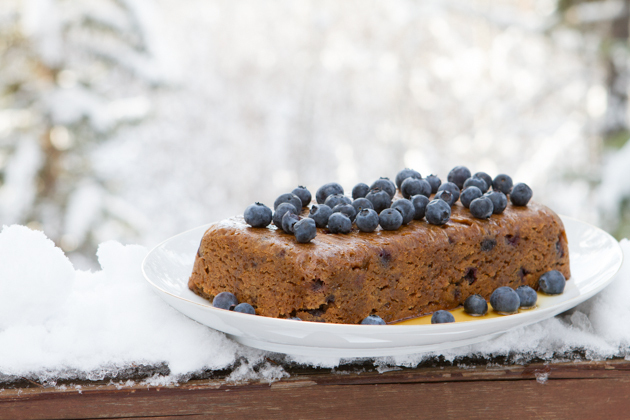 Drizzle with maple syrup and top with remaining blueberries. Eggs: I did not test this recipe without the eggs. You could try replacing the eggs with egg replacer, or 2 tablespoons of finely ground flax seed mixed with 6 tablespoons of warm water, left to sit for 5 minutes. Coconut oil: I am not sure if another type of oil would work for this recipe. You could try grape seed or avocado oil. Sorghum flour: if you wanted to make this recipe grain-free, you could try replacing the sorghum flour with chickpea flour. I do not think that coconut flour would work. Have you unwedged yourself from a boring dinner routine? What did you do to spice things up?